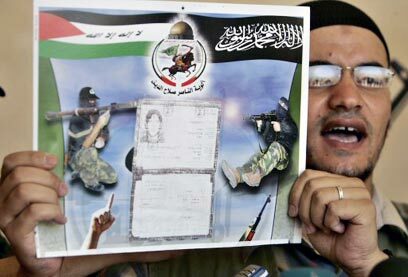 While Gaza Strip is under pressure of IDF tanks, West Bank terrorists attempt to exert their own pressure: The Popular Resistance Committees organization on Wednesday afternoon presented for the first time a picture of kidnapped settler Eliyahu Asheri's identity card. Asheri, a resident of Itamar, has been missing from his home since the weekend, and his family fears for his life. The organization's spokesman, Abu Abir, gave reporters identifying details on Asheri, including his date of birth, his ID card number and his parents' name. He even gave the youth's middle name, Pinchas, which was not published on the Israeli media. According to Abu Abir, the threats made by the organization's military wing to execute Asheri should the Israel Defense Forces invade the Gaza Strip are "serious." Asheri, according to estimations, was kidnapped at a hitchhiking stop and is being held in the Ramallah area or in Bethlehem. Samaria Brigade Commander Colonel Yuval Bezek arrived Tuesday evening at the house of the 18-year-old captive and promised his parents: "We will do everything to help you." The Asheri family woke up Wednesday to another morning of fear. The mother Miriam spoke to reporters who arrived at the family's home, but found it difficult to speak for a long time and seemed very excited. "We turn to those who are holding Eliyahu and ask them to watch over him and treat him well," she said, supported by her 14-year-old daughter Hayuta. "We ask them to return him alive to us and call on the public to pray for his wellbeing. He had not done anything wrong and there is no reason why they should do him wrong. We also want to say thank you very much to the security forces – the army and the Shin Bet – who have been exerting all efforts. We really trust them and appreciate their work," Miriam Asheri added. Turning to her son, she said: "Eliyahu, if you can hear us, give us a sign of life. Tell us what your condition is, so that we can know how you are mentally and physically." Miriam Asheri also thanked the leaders of the Itamar settlement, who have been looking after the family since Sunday. Later, she spoke about her son and the last moments she spent with him. "He was in his last year at the Neveh Tzuf preparatory program and had extremely developed spiritually. He is a very happy, generous and gentle child. The last time we spoke was Saturday evening when we attended a family event outside the community. We returned to Itamar, he stayed with relatives and planned to arrive the next day at the military preparatory program where he is studying. He did not have a mobile phone and it is pretty common that we are not informed that he is not coming home, so we were not worried," she recounted. Rabbi Haim Druckman, who defined Eliyahu as his "spiritual grandson" said: "I don’t think there is something knew beyond what we hear in the press. I doubt whether what is being said is true. I don’t think Eliyahu went to seclude himself, but was rather taken somewhere. As we are filled with anxiety, we are also full of hope that he will return safe." Asked what he would say to those who are holding Eliyahu against his will, the rabbi answered: "If he is being held, it is definitely against his will. How can one capture an innocent person who went for a walk with boys who study with him? We have to find every way to release him." Meanwhile, an Australian rabbi has urged the Jewish community to pray for the wellbeing of Eliyahu Asheri, whose father is Australian. Eliyahu Asheri is the son of Yitro Asheri, originally from Adelaide, who was converted by St Kilda’s Rabbi Philip Heilbrunn about 20 years ago. Rabbi Heilbrunn told the AJN that at the time of his conversion, Asheri was an electrician from Adelaide known by the name Cliff Harris. Following news of the kidnapping, Rabbi Heilbrunn issued a statement in which he asked members of the community to pray for Eliyahu. “A young boy, Eliyahu Pinchas Asheri, son of Yitro Asheri, is the child of a wonderful ger tzedek (convert) whom I converted over 20 years ago. Please ask everyone to say tehillim for him as well. His father is a most remarkable person who is a real tzaddik," the statement said. Rabbi Heilbrunn said Asheri had moved from the Adelaide suburb of Glenelg to the Jewish centre of North Adelaide at the time of his conversion. Asheri moved to Israel about six months after his conversion. He first settled in Kibbutz Sde Eliyahu where he learned some Hebrew and later moved to a yeshiva headed by Rabbi Haim Druckman, currently the Israeli prime minister’s special adviser for issues relating to conversion, near Ashkelon. The Asheri family, one of the founding members of Itamar, has lived there for the last 15 years. “Every time something happened around Itamar we always feared for them, but this time its them themselves,” Rabbi Heilbrunn said. See all talkbacks "Abductors present Eliyahu Asheri's ID card "